Jelly, the app that helps people from around the world answer each other’s questions, today updated its iOS app with new tools for posing and explaining problems. 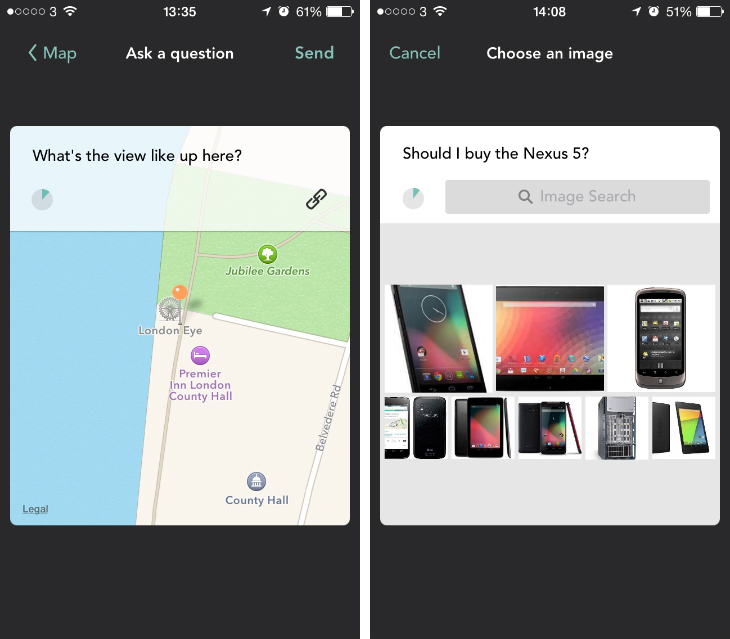 In version 1.1, you can now create a new question using a map and a specific location. When you tap the compose icon in the top-right hand corner, you’ll see a new mapping option alongside the existing camera tool. Here, you can choose your current location, search for a specific place, or swipe around the Google Maps interface and drop a pin in the center of the screen. As before, you can then write a note and add a URL if necessary. Likewise, when you respond to someone else’s question you’ll see a new map icon alongside the annotation and link options. It should be a valuable tool if you’re looking for directions, or perhaps explaining to someone where they should take a picnic. Questions with location-based information will also be routed to nearby users, ensuring a higher quality of responses from those with local knowledge. If you’re not much of a photographer, today’s update also makes it easier to pull photos straight from Google image search. Just type in what you need and Jelly will automatically offer a set of pictures that match your conundrum. As you can see from our example (above right) though, it’s not always perfect. When Jelly launched earlier this year, it received a ton of press due to the involvement of Twitter founder Biz Stone. It’s an unusual concept and these new features will only make it more useful, but it remains to be seen whether Jelly can maintain and grow its current user base.